Some 50 people gathered in front of Hungary's embassy in Bulgaria's capital Sofia to protest against Hungary's extradition to Azerbaijan of a man who murdered an Armenian army officer. 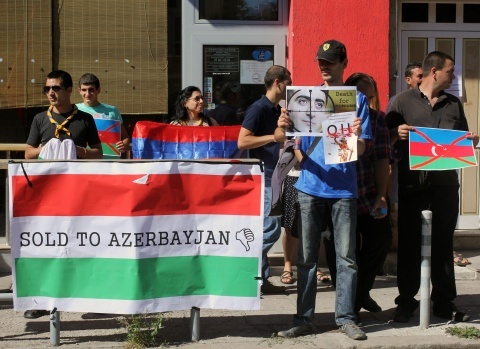 The protesters – members of the local Armenia minority, according to media - sang Armenia's national anthem and chanted "Shame on Hungary!" and "Disgrace!" They also threw small coins at the building of the Hungarian embassy, according to the Focus news agency. New protests are to take place in front of the Hungary's embassy in Sofia, the next one most likely to be scheduled for September 11, when a World Cup qualifier will be played between the teams of Bulgaria and Armenia. Armenians constitute Bulgaria's fourth largest minority. The two countries have had warm and friendly relations over the years. Relations between Armenia and Hungary worsened following Budapest's decision to extradite to Azerbaijan Ramil Safarov, serving a live sentence for the murder of Armenian officer Gurgen Margaryan. In February 2004, Azerbaijani army officer Safarov killed Margaryan with an ax while the latter was sleeping. Both men were attending an English language course in Budapest as part of NATO's Partnership for Peace program. In April 2006, a Hungarian court sentenced Safarov to live imprisonment. However, on Friday he was extradited to Azerbaijan, where he was pardoned by President Ilham Aliyev. Relations between Armenia and Azerbaijan have been tense since the conflict over Nagorno-Karabakh erupted in the late 1980s. Nagorno-Karabakh, a breakaway region on Azerbaijani territory with a predominantly ethnic Armenian population, claims independence from Azerbaijan. The war is estimated to have left more than 30,000 people dead on both sides between 1988 and 1994. Since then the region has remained under de facto Armenian control.